Ok, I’ll confess: I am writing this, simply so I can put up the fish pictures. Guilty. But I did come up with a decent enough running metaphor about this fishing trip. Let’s call it an online marketing plan. Just substitute it. The first thing about catching a fish like this, is to have a seasoned guide know where they are, and how to catch them. There are million fish out there, and lots of ways to catch different types. But I wanted to catch big fish, so I connected with my friend Darin. Darin fishes around Sanibel Island and the waters off Ft. Myers all the time, so he knows where to find fish, and how to catch them. He is an experienced guide, someone I can trust. 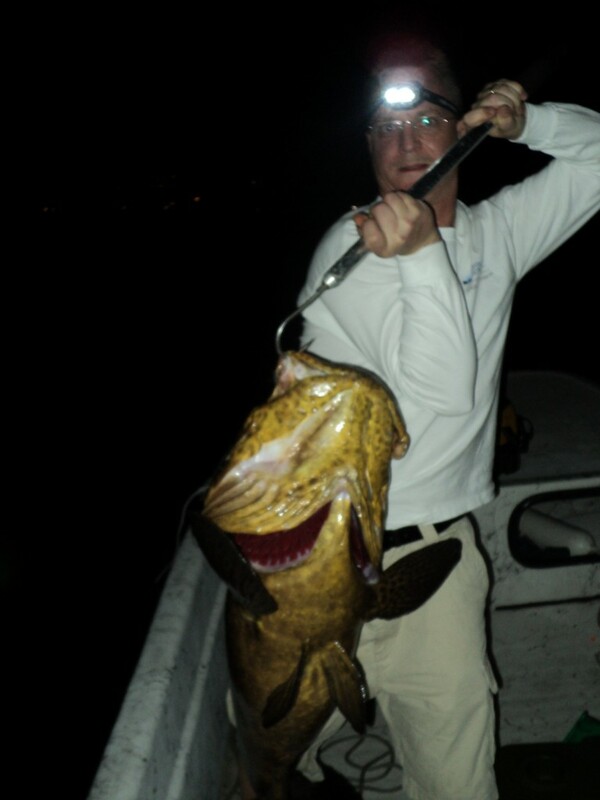 We were targeting big grouper – so this picture shows Darin is a good friend to know when seeking this kind of thing. You can catch plenty of different kinds of fish with or without help, but if you want the really big ones on purpose, you usually need help from someone who does it regularly. I am going to give away a secret bait: Ballyhoo. These little cigar-like fish are th e best bait I have fished with, I think. Everything hits them, in the same way that everything hits a shrimp-however, the types of fish, and potential for big ones is infinitely better with Ballyhoo, in my experience. Could be where we are fishing. But I have caught so many different species using them, I am convinced they are a great hidden secret. Darin told me, he started using them because he was finding them consistently in the stomachs of big fish he cleaned. Most guides and captains will use baitfish like shiners and pinfish, but Ballyhoo are unique. Why? Because they are not the easiest baits to find and catch. Darin came up with a unique system, where he stands on the front of the boat with a dip net he made (“All the store-bought ones kept breaking,” he explained). I shine the light on the water’s surface, and he scoops the baits. We do it slowly like this, by hand, and it can take a long time sometimes depending on the conditions. Sometimes, we chase the bait around trying to find them. Sometimes, they seem to be everywhere. And different fish mean different baits. If we were going after Tarpon (more on this later), we’d have been catching Ladyfish. 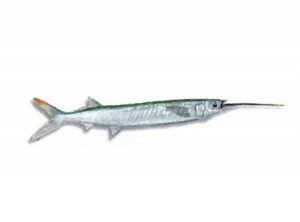 Ladyfish are munched by really big Tarpons, so it makes sense. Ballyhoo are munched by Grouper – so we went after them with the dip net. It was painstaking – but with purpose. The key to successful saltwater fishing, is to know what the fish you want to catch will eat. Using that as bait only makes sense, even when you need to figure out a unique way to capture the baits that work. Not to be coy, but the Gulf of Mexico is a big body of water. Knowing where to fish in it to actually catch something on purpose takes a long time, and lots of effort (see qualified guide, above). However, with the help of a qualified guide, finding fish is not so difficult. And once you know where the bigger ones are, you can become selective in which ones you go after. A guy like Darin knows where structure is under the waves, and other common water markers both above and below the water’s surface. He also knows how the tides move, how fish behave, and even the general layout of what look to me like repetitive, nondescript clumpings of mangrove trees. Darin takes us to the right place, quickly, and with purpose. We don’t mess around when we go out – usually on the bait within 30 minutes of hitting the water, and fishing about 30 minutes after collecting them. But once we have bait, we don’t throw it indiscriminately wherever we end up, and hope a big fish happens by. Sure it could happen, and sometimes does – but there are better ways to target when you allow experience to guide it. 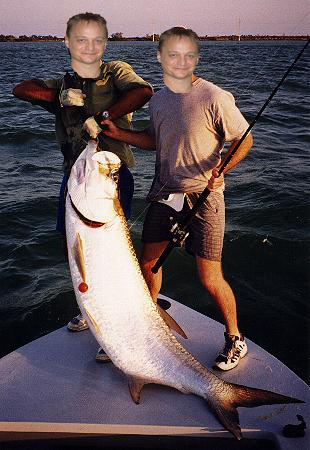 We were after big Grouper here, so we went to a place where they hung out, armed with plenty of delicious Ballyhoo. We increased our odds exponentially – based purely on Darin’s experience in the area, and my willingness to trust it. Landing this guy took a long time. He hit, and then ran and wrapped under a bridge piling (they are smart like that). I fought him for a long time, and then was convinced he was not coming up. I never let go, though – I never let slack get in the line, so he could flip off. I handed the pole to Darin, to see if he could pull him out from the snag. He did, and we landed him a little while later. The old guy was tired, and reeling him up became pretty easy, once we moved him back into open water. When we pulled him up, Darin stopped, and got out a pliers. He found a couple leaders and hooks tangled-up in this guy’s mouth – so Darin cut and pulled it all out of his way, to make it easier for him to swim, and to breathe. We laughed at how many times the old codger had bested attempts to catch him…we saw the proof. He was a grizzled, gilled, salty old pro – but he surely bit, again, for us. And we didn’t give-up on catching him – we kept on him no matter what, and we got him in the boat. One of the types of fish we go after down there, are Tarpon. Tarpon are really beautiful fish that grow incredibly huge. The first thing a Tarpon does when he is hooked, is jump straight out of the water – so they are very exciting fish to catch for sure. The night Darin and I were fishing for the big Grouper, there were about five or six big Tarpon rolling under a light. We actually intentionally fished around them – because we were after the Grouper. Darin took one of our Ballyhoo rigs, removed the weights, and pitched it on the other side of the boat, where we could hear Ladyfish splashing. He quickly landed a Ladyfish – took the hook from its mouth, and put it behind the back fin. He cast it back out, heaving the Ladyfish (about 16 inches long) into the waves. Literally 3 minutes later, a HUGE Tarpon burst through the top of the water. Darin handed me the pole, and it was on. He jumped a few more times, and I fought him for about an hour, I think. Strongest fish I have ever had on a pole – a simply awesome feeling for a fisherman. He was about 7-8 feet long (gets longer every time I remember him), and about 200 pounds. At one point during the fight, I had him on the surface of the water. We pulled up anchor, and this Tarpon pulled the boat around for about 10 minutes. I was standing on the bow, and the pole was doubled over with this massive, beautiful creature just swimming slowly, about 6 inches below the surface, trying to get me off his back. He surprised us more than once by playing possum and then taking off again, starting the fight all over. I almost knocked Darin into the gulf a couple times, almost crushed him when the fish ran under the boat and he was too close, and got really really sore after a little while fighting this fish. We finally tired him out, and got him alongside the boat. He was amazingly beautiful. 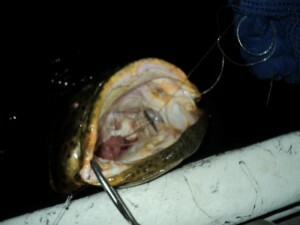 Darin gaffed him in the mouth, and we pulled him halfway out of the water – it was about all that was easy to do. We wanted to get a picture, but he was simply too big to get into the boat safely…so I was holding him by a gaff, over the side. Darin got the camera off the console, and the fish suddenly wiggled with this full body shimmy – almost pulling me into the drink. His mouth came off the gaff in slow motion, and he slipped back down – vertically, and ever so slowly, fading down into the dark green waters of the gulf. Gone. But oh my – what a ride. 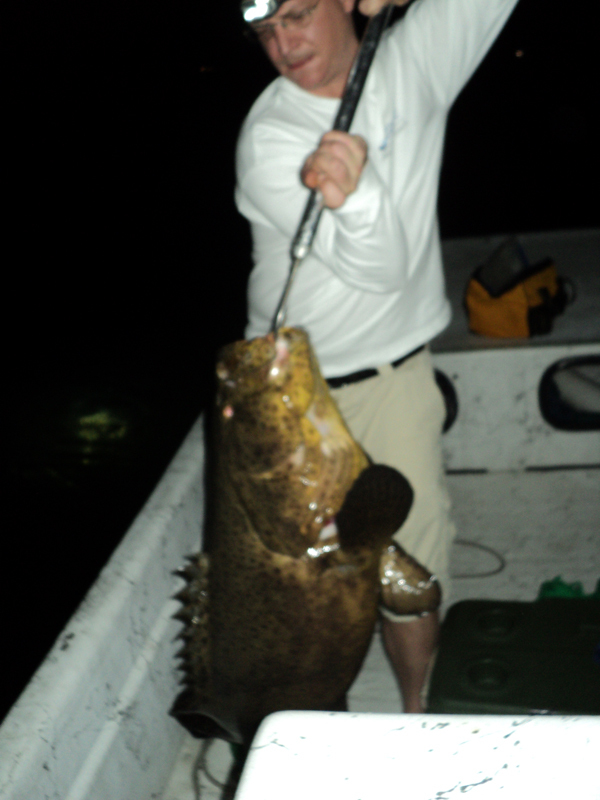 The point is, I could have stopped with the Goliath Grouper that night, and had an amazing story to share. But Darin gave me a fishing memory that trumped it – no less than an hour later. I went from huge, to huger. And huger still is out there – waiting for another day. Since I didn’t get a picture of this guy, I modified one I swiped from online, so you can see what I mean by big fish…Tarpon are amazing creatures – I highly recommend catching them, at least once. Nothing like it. Be persistent and don’t allow a snag to make you stop – there could be a goliath at the other end of that line! I hope I have made it perfectly clear how an online marketing plan is exactly like fishing with my friend Darin for Goliath Grouper off Sanibel Island in Florida. Exactly, in every possible way. i jusst came back fom cabo sanlucas i want to fish for big grouper and learn where and when best time to fish for them.